This post has a funny tittle huh? Well let me see if I can make sense of it all. Let me start with today marks our 3 year anniversary that we started the process of adoption. I never would have thought it would have been this long of a journey. I certainly had no clue as to how incredibly difficult the process was going to be either. This was not my plan A. In comes Plan B. Plan B circumstance examples- "You feel like your pouring your heart out to God and your prayers are bouncing back and nothing is changing in your circumstance. You've been praying about a dream that feels like it is slipping. You've been praying about an unmet expectation. But nothing. You pray but you see no change in your circumstance. You pray but the things you are dreading still happens. You pray but you still feel all alone. And maybe not just alone. You feel like you've been kicked in the stomach. When the One you depend on to give you what you want doesn't do His job, you feel betrayed, let down, thoroughly disillusioned. I have never been so stretched. As the mother of 4 biological sons I am covered in stretch marks from pregnancy. Adoption on the other hand has put the stretch marks on my heart. Unfortunately some comfort food weight gain has come into play too. Sorry I digress. I have started a new book recently and like so many other times in my life it could not be more perfect for what is happening in my life. Especially how it has gone over the past 3 years. 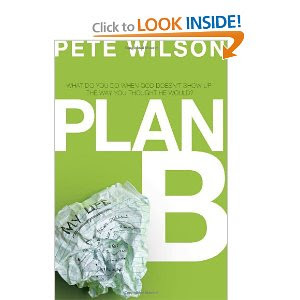 The tittle is "Plan B, What Do you Do When God Doesn't Show Up The Way You Thought He Would?" by Pete Wilson. Check out this you Tube Video about it HERE. This is a HARD book and it has been kicking my tail but it is also very real and comforting. I am learning that control is just an illusion. I can not control the outcome of my life. The only thing I can control is how I respond when life brings me a plan B situation. Hopefully to surrender. Hopefully giving room for God to work. "The process of becoming the person God wants us to become doesn't come from success, success, success. It's loss, success, failure, success, heartbreak, success, disappointment, success." "We tend to think God is with us only when everything is working great and all the charts of our life are going up and to the right and we think that our Plan B situations are signs that we're not where God wants us to be." What a HUGE comfort to know how untrue that last statement is. That thought process can destroy your faith. I am learning that my faith must rest in His identity and not necessarily his activity. Placing your faith in what God does (usually what you want him to do) brings so much frustration and disappointment because we will never figure out God's ways, which are higher than ours, this side of Heaven. I have to ask myself this question ( a quote from Andy Stanley ) "Am I going to define God by interpreting my circumstances or am I going to simply trust that God is who he says he is?" Ever heard the saying God will never give you more than you can handle? I am learning nothing could be further from the truth. The truth is throughout life you will face one situation after another that will be completely beyond what you can handle and we have a choice to either abandon God or worship Him in the midst of it. The Bible is packed with stories like that. We get to ask ourselves are we going to serve His kingdom the way He asks or the way we want to? My plan A was Guatemala, in and done in about a year....Never would have I chosen Foster Care NEVER!!!!!! I am thankful though for those God has placed in my life who have not judged me in all of this process. Those who have not looked down on us and who have stood faithfully by us in prayer. Those who GET IT! Three years is a long time to hang I know and some of my closest relationships have come out of this Plan B situation. I am learning more about the cross. The seeming ultimate Plan B scenario. I have learned that part of why some of this past 3 years has been so hard is because I have wanted what I thought God could give me more than I wanted God. Here is where this post tittle comes in. It was Friday when Jesus was crucified. How devastated the disciples must have been and how that hopelessness intensified as they moved into Saturday. Good Friday is the day redemption happened. Easter Sunday is a day of celebration. "Saturday was a day of questioning, doubting, wondering, and definitely waiting. It's the day of helplessness and hopelessness. Sometimes throughout this process I have felt so helpless and hopeless. I am learning God does His best work in helpless situations. I can either hope for something or I can hope in someone. The Someone who is powerful, in control and who can and will do the impossible and that is not based on whether my life turns out the way I want it to turn out. I am learning that if I feel distant from God it is because I have drifted not because he's left. SUNDAY IS ABOUT TO DAWN!!!!!!!!!! What a fantastic post Michelle! What a hard journey, but it blesses me to see how you have clung to Jesus with all your might and grown so much through it all. Love you very much! Awww Leah thank you so much for your faithful love and support. I love you very much back! Wow, Michelle this is such a great post. You are such a talented writer! I love this line of yours "Adoption on the other hand has put the stretch marks on my heart." It's so beautifully well said. I will keep you and your journey of faith in prayer and I look forward to hearing what He does for you!! Charlotte I am so glad our paths have crossed! Thank you for praying and sharing in the journey. Hi Michelle, I am too! so glad you're enjoying the book! thanks for your sweet words! I started reading Plan B recently and am excited to get more into it! I'm sorry to hear about the disappointment of court. Adoption is a roller coaster with steep drops, sharp turns and a slow uphill climb at times. God is in it all and I pray he will comfort you and give you peace. You have a great blog. Thanks for sharing it! Thanks for stopping by and taking the time to leave your thoughts Gina. Thanks for your prayers too. Enjoy Plan B it was very timely for me.